We recognise the importance of providing a nutritionally balanced diet to ensure healthy growth and development. Our menus are varied where children have the opportunity to try a variety of foods and any special diets are catered for. We provide food that is low in salt and sugar and do not add any extra salt in cooking. The health and well being of children are important to us and we promote healthy eating and physical exercise. We support children to make healthy choices for a healthier life style. We promote healthy eating and provide a morning snack at 10.00 a.m. which includes toast and fresh fruit and vegetables, a cooked lunch at 11.45 a.m. and a light tea at 3.00 p.m. again with fresh fruit and vegetables, all meals are cooked fresh daily on the premises. We are also able to purée the freshly cooked meals for the babies to enjoy. These are included in the sessional fees. We have received the Healthy Heroes Award from Lancashire County Council. Smile4life is a programme which is all about reducing the high levels of tooth decay that occurs in many children’s lives. 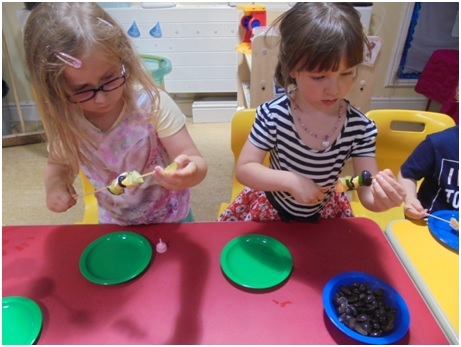 We as a nursery already support (and will continue too) this programme, by providing healthy, well balanced nutritional diets, not only at meal times but snack times too. We ensure all meals are low in sugar and have no added salt. We have received the Smile4life Award from Lancashire County Council which is also supported by the NHS. We are also continuing to promote healthier lifestyles as well as highlighting the importance of regular tooth brushing and dental check ups. Please feel free to browse the information surrounding Smile4life, should you require any further information or assistance please speak to our Oral Health Champion Haley Agar.